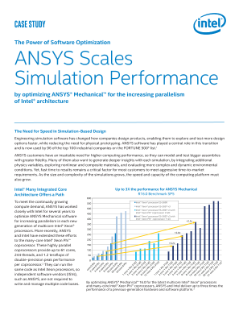 Case Study: Discover the compelling performance benefits of ANSYS® Mechanical™ software, running on Intel® Xeon® processors, which enables efficient parallel execution on distributed memory systems. The Intel® Xeon® processor E7 v2 family supports real-time analytics with better performance. Real-time predictive analytics and business intelligence uncovers new performance, opportunities.